A year ago yesterday, on October 15th, International Pregnancy and Infant Loss Remembrance Day, I wrote to Sebastian on Unspoken Grief. I was feeling very blue and needed to write with a bit more anonymity than usual. Looking back at what I wrote, I feel so fortunate to be where I am, one year later. We are incredibly blessed to have our sweet E and our lovely baby daughter… and honestly, I feel blessed to have Sebastian in my life, too. I can’t regret that we had him, even though the experience has been so sad. 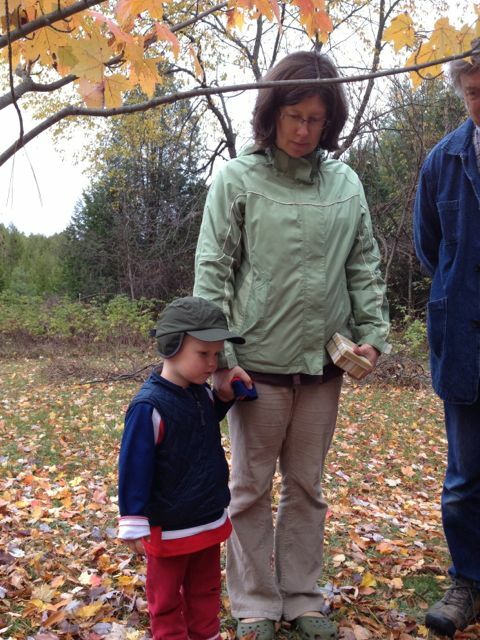 This year, to honour the day, we finally buried Sebastian’s ashes under a sugar maple at my parents’ house. We wanted to commemorate the day, but keep things as small and simple as possible; something formal and ceremonial would have felt wrong. 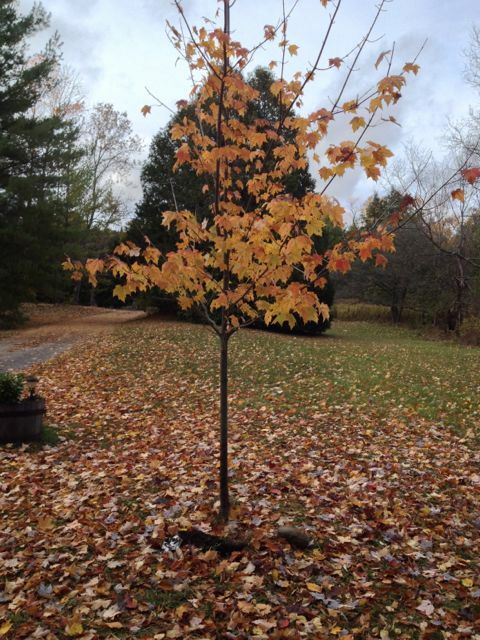 The tree was brighter and more multicoloured a bit earlier in the season. Still pretty, though. Sean and I dug a small hole – we only needed trowels. The ground was damp and easy to dig. We had explained to E that we were going to have a little burial for Sebastian, much as we did for my parents’ cat, Griffin, over the Thanksgiving weekend. We glossed over the concept of ashes…. We have talked before about how once people and other creatures die, their bodies become part of the earth – so we just reminded him about that, so he knew it wouldn’t be Sebastian’s body we were burying. He seemed unfazed. He has recently taken to saying, “Shave and a haircut, two bits” to amuse himself, but now he modified it to “Gonna have a ceremony, two bits.” Leave it to a three-year-old to inject levity and irreverence. But when we were out there, he was very earnest. 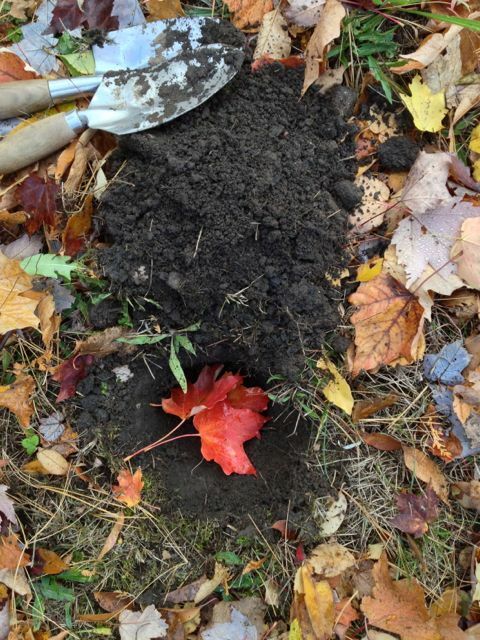 We each chose a pretty maple leaf to go into the little hole with Sebastian, including one on Baby A’s behalf. E helped us pour the ashes and fill the hole and put the rock on top. Then he quite ceremoniously placed a trowel on top of the rock, I guess because it seemed apropos to him. Then we had a moment of silence, holding hands in a little circle around the tree, and said a few words to our little second-born. We told E about how Sebastian would actually become part of the tree, because he would be absorbed by the roots. E explained to us how “Sebastogen will climb up it.” Made sense to us. It was a chilly, grey day – but we did a have a few moments of sunshine through the leaves, with an unexpected slice of blue sky. 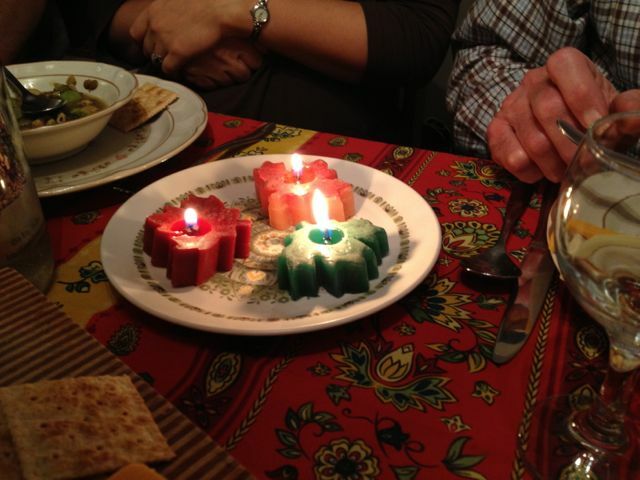 At 7 p.m., we lit these maple leaf candles, homemade long ago by Auntie Beth, to be part of the continuous wave of light commemorating all those babies who are gone too early. I know there were a lot of people out there joining in, contemplating their own candles and sending love for the families of those babies, all over the world. Love has made such an enormous difference to us, and, I’m sure, to countless other grieving families. mama lola recently posted..pizza pops! so sweet and so difficult. love you. E & A will be glad later that you recorded this memory for them, burst of sunlight and all. Love you too, Quinn. I hope they will be interested to read all this someday, as you say. It was a beautiful day. Along with grey clouds and chilly fall temperatures, there were warm colours all around, and a kind of special hush hanging in the air. I was really glad to be there, and to be part of the circle around Sebastian and his tree. This little ceremony seems exactly right; thank you for sharing it. It’s important that E and A can acknowledge their brother, but right that they can carry it more lightly than the parents, who comprehend it more fully and therefore more sadly. If their hearts can hold him, but not be burdened, that is wonderful. 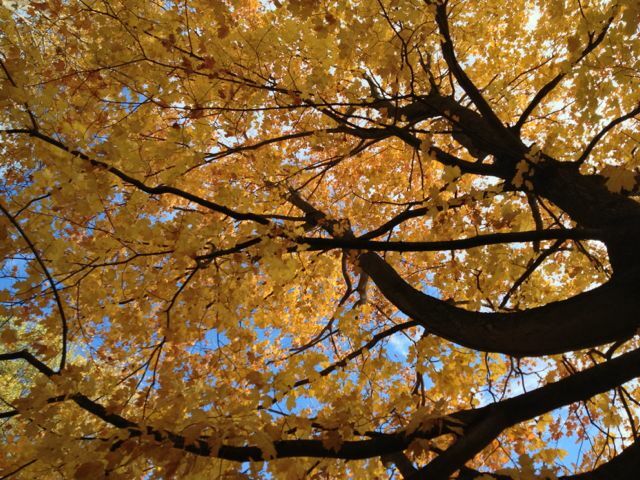 May the seasons come and go, the tree grow, the children climb, and the sadness mellow into a cherished but not heavy memory. Love you all!! What a lovely tribute to Sebastian’s memory.